Republican Brian Kemp is sworn in as Georgia's 83rd Governor Monday, January 14, 2019 at Georgia Tech's McCamish Pavilion. But in the cavernous cathedral, Kemp was just another parishioner receiving words of encouragement. Brian Kemp is Georgia's 83rd Governor. GPB's Stephen Fowler chronicled the inauguration and Kemp's first official day in office. “Grant, Almighty God, that all who profess good faith in the common good be united in your truth, live together in your love and reveal your glory in the world.” Thus began the prayers of the people delivered by Dr. Benny Tate, senior pastor of Rock Springs Church in Milner. Before being sworn in later in the afternoon, the Athens Republican heard from Tate, other pastors, bishops and a rabbi. 16 clergy members participated in the service and set the mood for the day. The cathedral’s choir sang the text of Psalm 100, whose reminder to come before the presence of the Lord with song reverberated from the ceiling. And Sam Candler, Dean of the Cathedral of St. Philip left the worshippers and governor-elect with a message to serve others. Later that afternoon Kemp’s family played certain roles in his swearing-in at Georgia Tech’s McCamish Pavilion. Oldest daughter Jarrett delivered the invocation to watch over members of the military, statewide officials and her father, the new governor. Kemp’s wife Marty and the pair’s other daughters, Lucy and Amy Porter, joined him on stage. 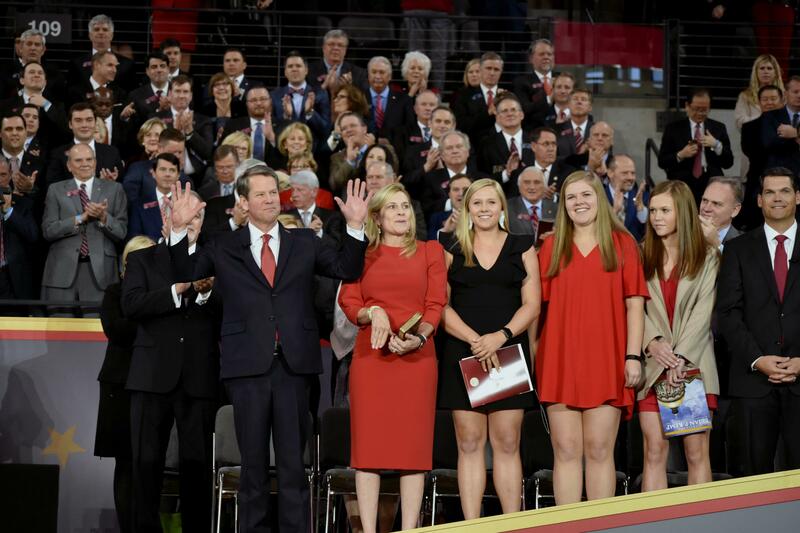 Governor Brian Kemp, wife Marty, and daughters Jarrett, Lucy and Amy Porter wave during the inauguration events Monday, January 14, 2019 at Georgia Tech's McCamish Pavilion. Cheers erupted from the crowd that filled most of Georgia Tech’s basketball arena as Kemp took the oath of office to become the 83rd Governor of Georgia. Everyone from Atlanta Mayor Keisha Lance Bottoms to Republican U.S. Senator Johnny Isakson to former University of Georgia football coach Vince Dooley watched the swearing-in of Kemp, new Lt. Gov. Geoff Duncan and the other statewide officers. In his first speech to Georgians as governor, Kemp reiterated some of his campaign’s focus areas like education, and made a pledge to unify the state following a tight and prolonged contest with Democrat Stacey Abrams. As governor, Kemp said he would work to serve all Georgians, not just the ones that voted for him. Kemp’s final public activity of the day took place at Liberty Plaza outside the state capitol. 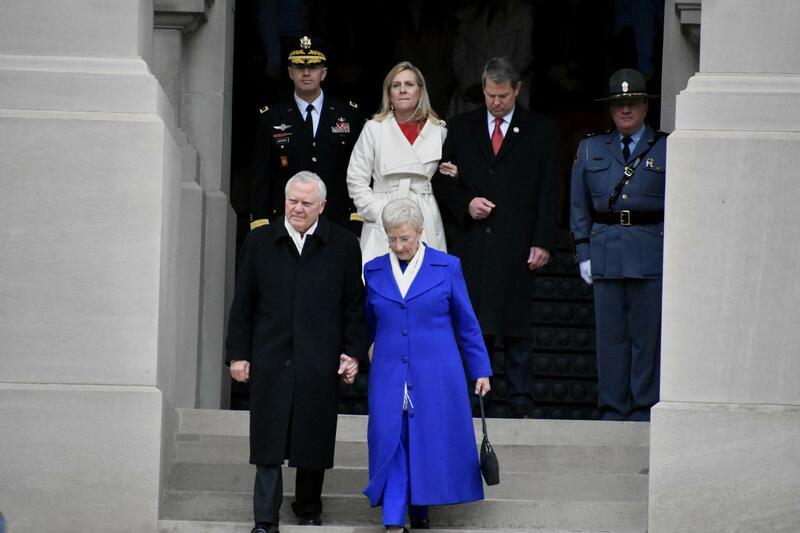 The new governor and first lady participated in a review of military troops, complete with a demonstration of helicopters and a 19-gun salute that echoed through the downtown streets. Afterwards, the Kemps were reunited with outgoing Governor Nathan Deal and his wife Sandra before exiting out the back of the capitol. A bagpiper’s tune cut through the crisp air as the Deals walked down the steps one final time before leaving in a black SUV. Brian Kemp retreated into the warmth of the capitol, ready for a new day as the new governor. Outgoing Governor Nathan Deal and his wife Sandra leave the State Capitol one final time as new Governor Brian Kemp and his wife Marty look on. Listen to the full speech delivered by Brian Kemp after being sworn in as Georgia's governor during a ceremony at Georgia Tech's McCamish Pavilion, Monday, Jan. 14, 2019, in Atlanta. Monday is a pivotal day in Georgia politics. Brian Kemp is being sworn in as the state’s 83rd governor while Geoff Duncan becomes lieutenant governor and Brad Raffensperger takes on the role of secretary of state. It’s also the first day of the legislative session. The Georgia General Assembly now has 40 days to pass new legislation and shape the future of the state. GPB Politics Reporter Stephen Fowler and “Political Rewind” host Bill Nigut stopped by “On Second Thought” to explore both of these topics. Monday is Inauguration Day and the first day of the legislative session. GPB Politics Reporter Stephen Fowler and "Political Rewind" host Bill Nigut spoke about both events with "On Second Thought" host Virginia Prescott.